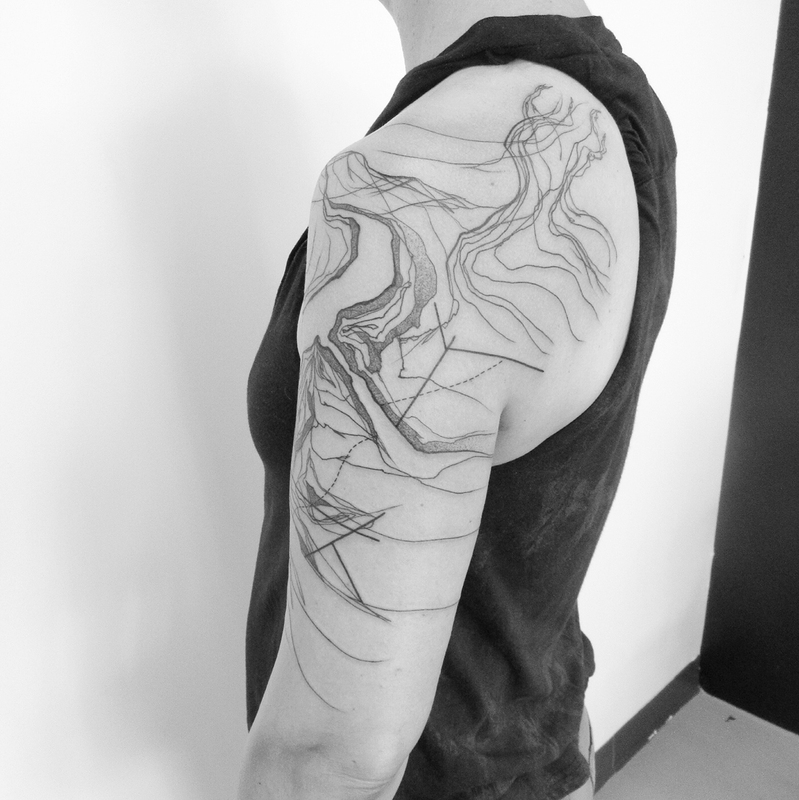 Katakankabin (“Kat” for short) is a tattoo artist working in an experimental style she calls “custom black lines.” Animals, plants, and topographic outlines are abstracted into undulating forms that merge with the contours of the body. 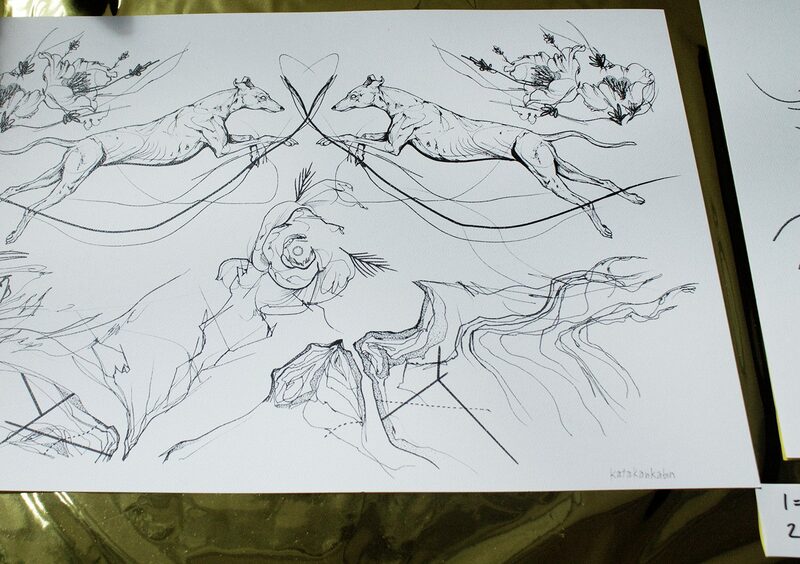 Her work is an expression of intangible energies, such as movement and emotion. Having traveled extensively, Kat currently works out of the studio Minuit Dix, a vegan, female-centered studio in Montreal. 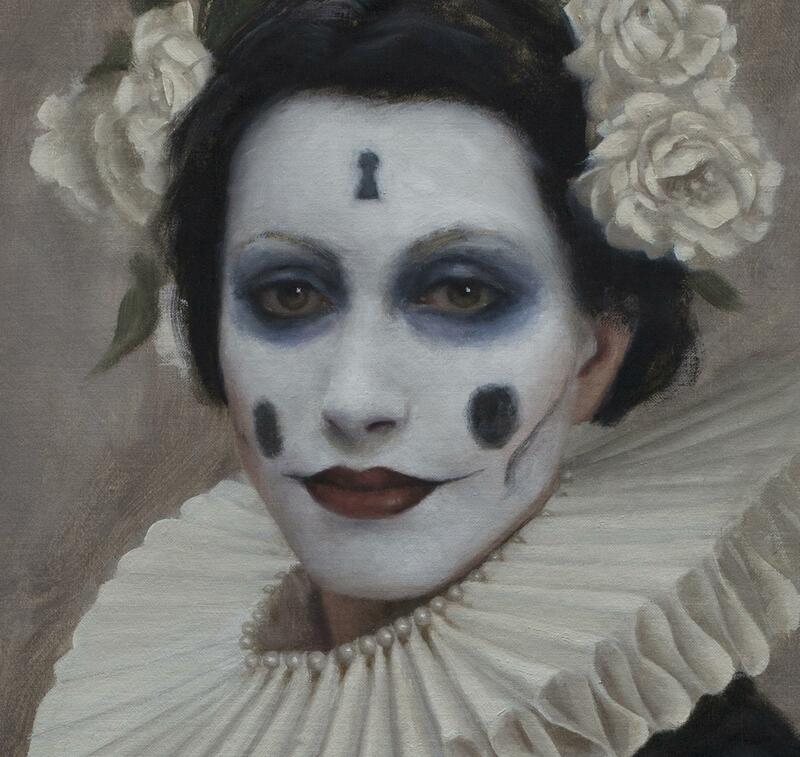 She attended this year’s 15th Annual Art Tattoo Montreal Show, and Scene360 was excited to talk with her about her art practice and perspectives. 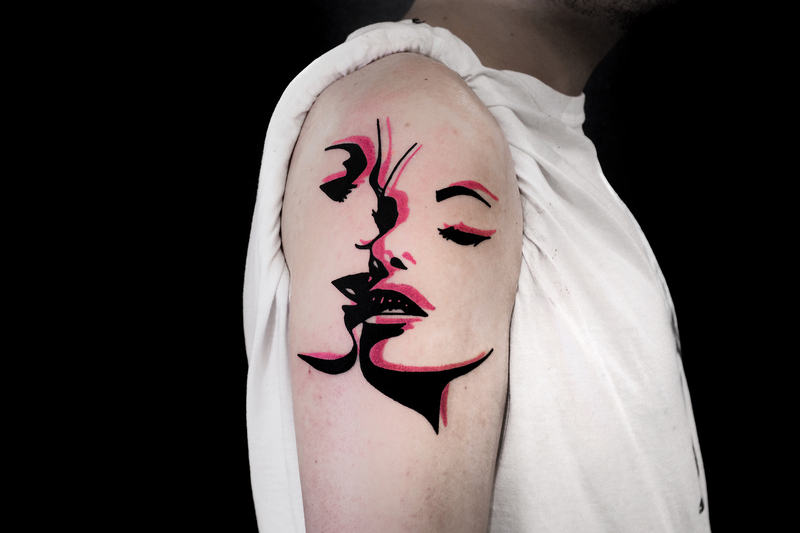 As Kat reveals, tattoo art is not only an evolving art medium with endless stylistic possibilities, but it is also emerging as a center for ethical communities and feminism. Read on to learn more about her story, and be sure to visit her Instagram to see more of the beautiful experimental tattoo art she’s been creating. 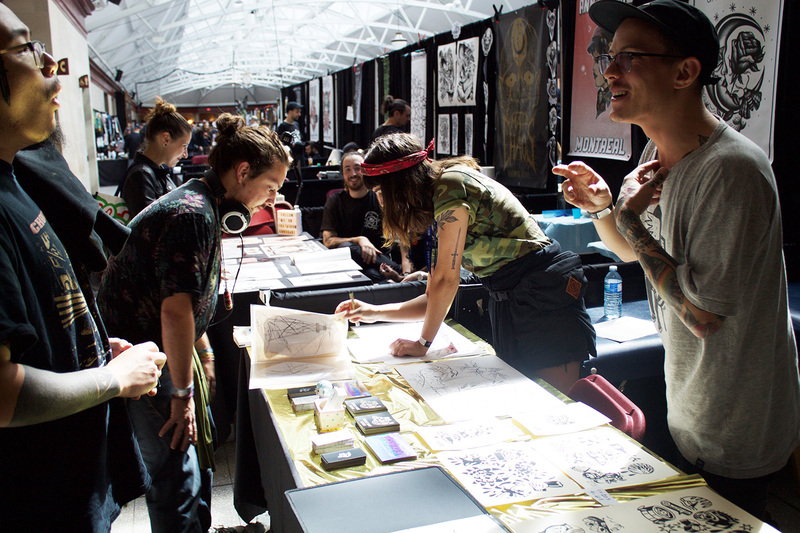 Top: Katakankabin talking with a prospective client at the Art Tattoo Show Montreal. 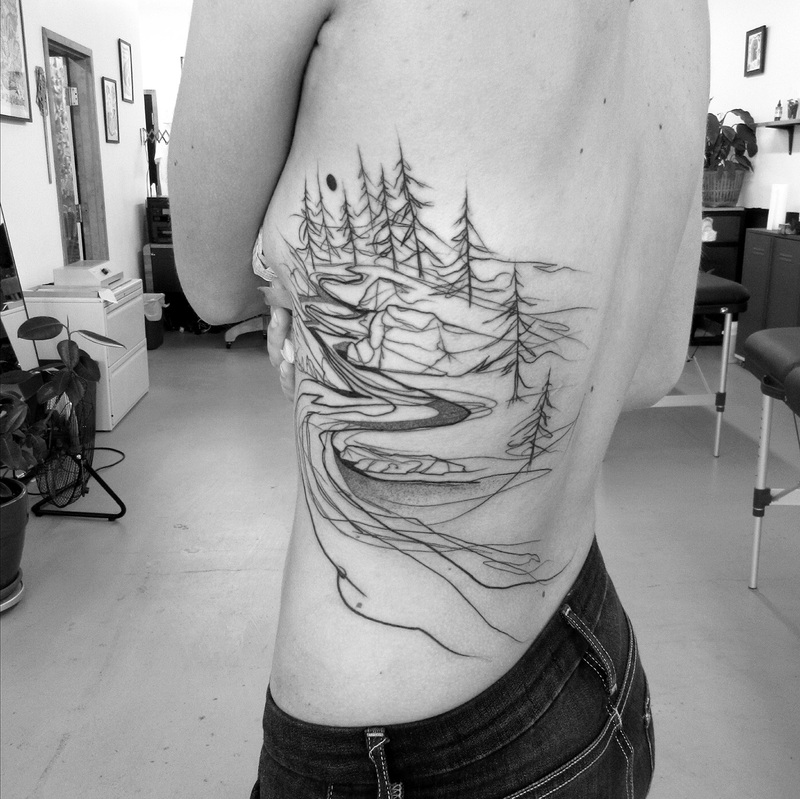 A beautiful landscape tattoo showing Kat’s appreciation for topography. Montreal is thought to be a creative and passionate city. 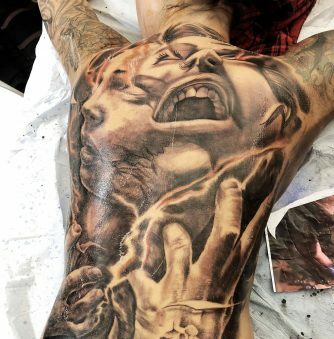 How would you describe the tattoo community here? I don’t know too much about the tattoo community in Montreal, because I mostly work in other places. Here, I am mostly in a private studio. 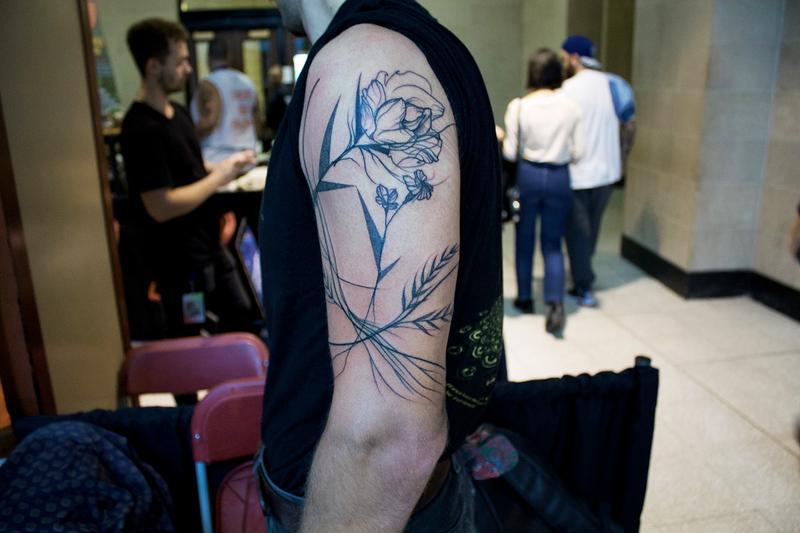 But there’s lots of good artists, and people get a lot of interesting tattoos in Montreal. So I feel it’s a place with a lot of action and talent, and clients are a lot of fun. Sample illustrations from Kat’s booth. 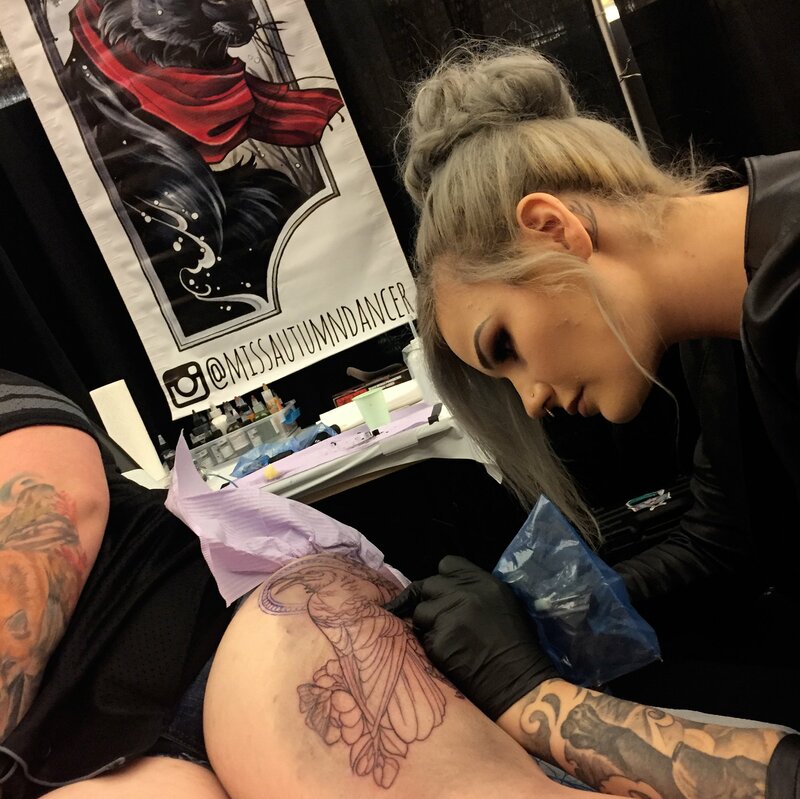 How many times have you participated as an artist in the Art Tattoo Montreal Show, and what kinds of interesting things have happened at this event? It’s my third time. [The first time] was a really important event for me. 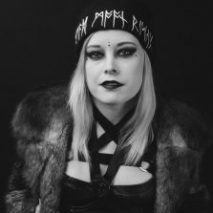 I originally did my apprenticeship in Mexico, and when I got back to Montreal, it was just before the tattoo [show,] and I participated, and it really helped to create a clientele. And at that time, I was still doing weird drawings, and people were like, “Oh, I’ve never seen that at a [tattoo convention]. It’s weird.” But now there’s more and more artists doing creative stuff. But that first year I did it—like, four or five years ago—[my style of tattoos] was still kind of weird and new. 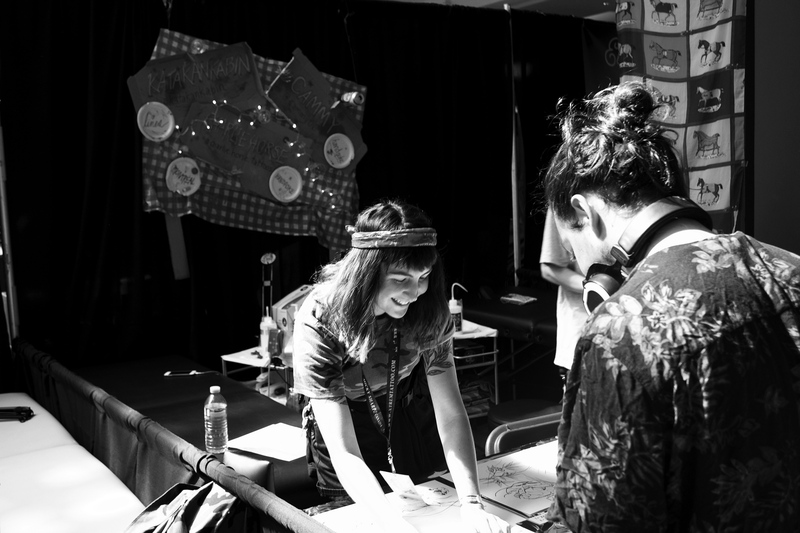 Many convention-goers were drawn to Kat’s unique tattooing style. On the right is Charlie Horse, who shared a booth with her. Tell me about your residency at Minuit Dix, which you began in May. Can you describe the studio? And how does the studio’s environment reflect your own personal and artistic values? I’m so happy that this studio opened, because I feel it’s the kind of space that’s really missing in the tattoo industry. [Other studios] in the world are starting to have a more progressive space, a feminist point of view, and vegan [products]. When I was in Montreal two years ago, at the studio where I was working, I worked really hard to turn that place vegan, so it would be the first vegan tattoo studio in Montreal. And then Muriel—the owner of Minuit Dix—opened the shop, and I did a research project with her about vegan tattoos and feminism. It was perfect timing; I really wanted to work there, because it was more towards what is important to me. Like, if you had the choice to use products that don’t harm animals, I would go towards that, all the time. 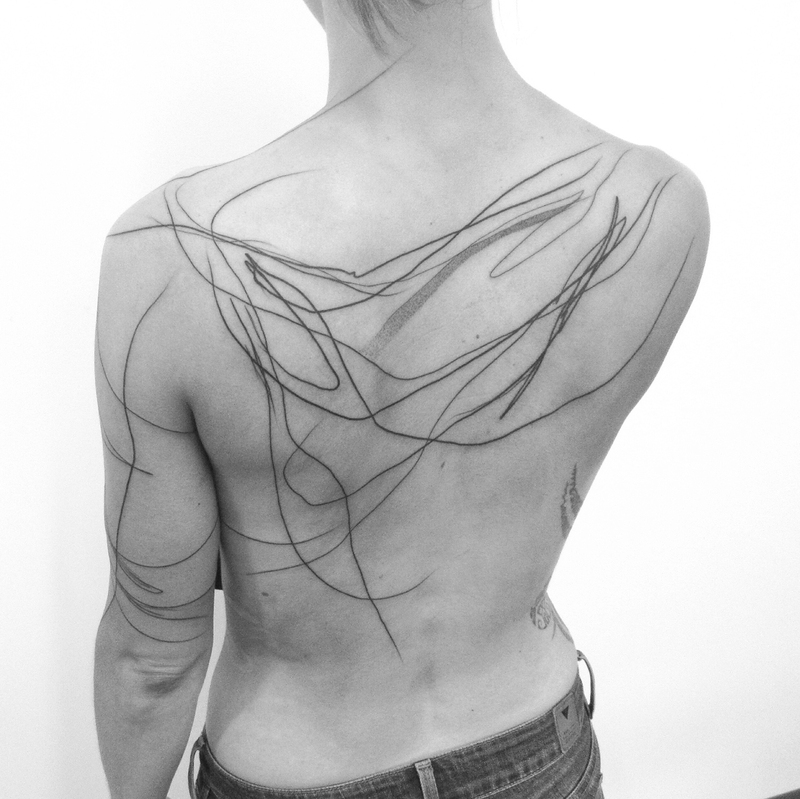 A back tattoo showing Kat’s ability to create beauty using experimental linework. From what I can see, all of the artists at Minuit Dix are women. I think this is wonderful, because the tattoo industry has long been a “boys club.” In your experience, what is unique about a female-centered tattoo studio? It has a really different energy, and I really appreciate it. Female artists have a really good touch [when it comes to] listening to their clients. And I feel really listened [to] in the space where I work—there’s nothing that makes me uncomfortable; we always talk to each other and make sure everything’s fine. It’s one of the easiest spaces I’ve worked in. It might just be a coincidence, but . . . it’s really respectful. Kat begins inking the floral half-sleeve she tattooed on Saturday of the event. Shifting to your work as an artist now, your style—which you describe as “custom black lines”—is beautifully unique, and has an almost meditative quality. How did you first discover your style? Before tattooing, I was doing a lot of drawing for comic books and silk screening. It was really different. When I started tattooing, I thought I would go towards dotwork and really precise designs with straight lines—that was like the thing I thought would make the best tattoo ever. But people—my clients—would always ask me for those little hand drawings I was doing, and then finally, I thought it would be more personal to go towards that and just fully do it—so now I don’t bother anymore with straight lines. Almost finished. This session took about three hours. Have you always enjoyed creating abstract art? Yeah, I really like the aesthetic. I really like electronic music—MUTEK is a [electronic music and digital art] festival I really like, with the dark, experimental atmosphere. 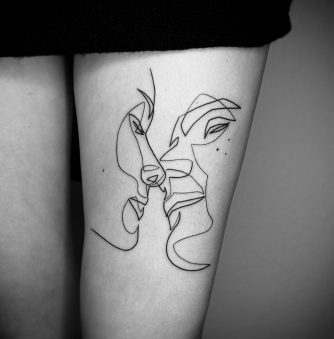 But maybe [my love for abstract art] became more pronounced in my tattoo art . . . It was easier to integrate on the body. Like, you don’t necessarily need a meaning behind [abstract art]—it’s more an expression of feeling or forms or movement. There’s so many! 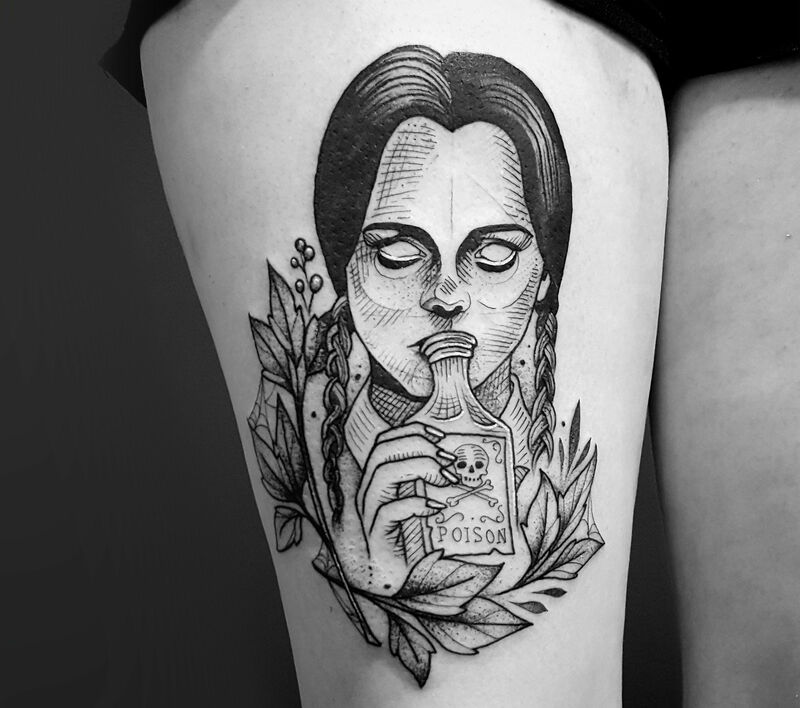 One of my favorite artists in the tattoo industry is Emilie Roby. She’s also Montreal-based. She tattooed my chest. I like the way she works with people, but also her aesthetic could be in the same direction as me—it’s really abstract, and every line is precise, and she thinks a lot about what she draws. And she has her own studio, which is really a reflection of her. It’s her world. So she inspired me a lot. But then there’s tons of other artists [who inspire me], such as friends whose drawings I like. My roommate, June Barry, does video projection mapping, and I feel we also share the same aesthetic of lines and experimental art. Another example of a gorgeous arm tattoo by Kat. You mention in one of your Instagram posts that topography is one of your favourite tattoo subjects. Why is this? I guess because when you think about lines, there are [subjects] that better show their power, in a way—and topography is a lot about linear stuff, but it can be abstract at the same time. And I like that. I studied geology for one year, and I really like landscapes. Planet Earth is a big inspiration. 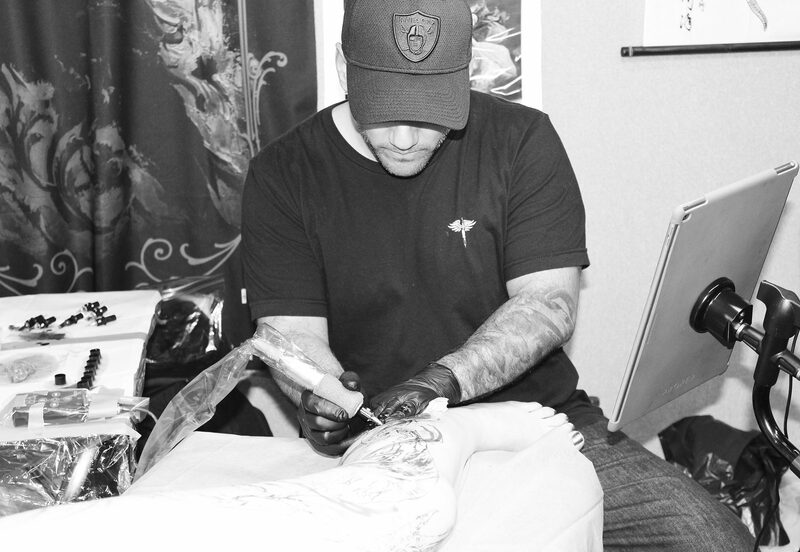 What other subjects do you enjoy tattooing? I guess nature is a big one, but also architecture is something I enjoy. I studied architecture, also. Nature, architecture, planets, landscapes—I really like all that. I have specific clients who really like more geeky stuff, like brain-inspired designs, such as neurons. I like that a lot, too. This is the skeletal boa tattoo Kat describes in the interview. 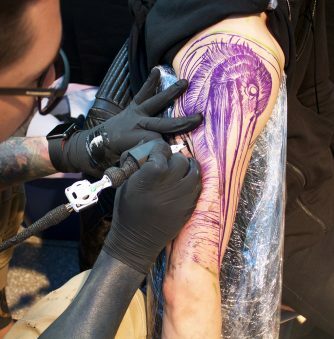 What was it like to create the skeletal boa tattoo? It was really fun. [The client] was traveling, so we met the day before to exchange ideas, and then I drew the design the same morning. We tattooed it for seven hours. I like to concentrate for really long hours—it’s like a meditation. Even for the client, it’s really meditative. It’s fun to push, I think. In my perspective, I would like to be more specialized in big pieces, more and more, doing big back pieces or a project over two days . . . that would be the ideal. 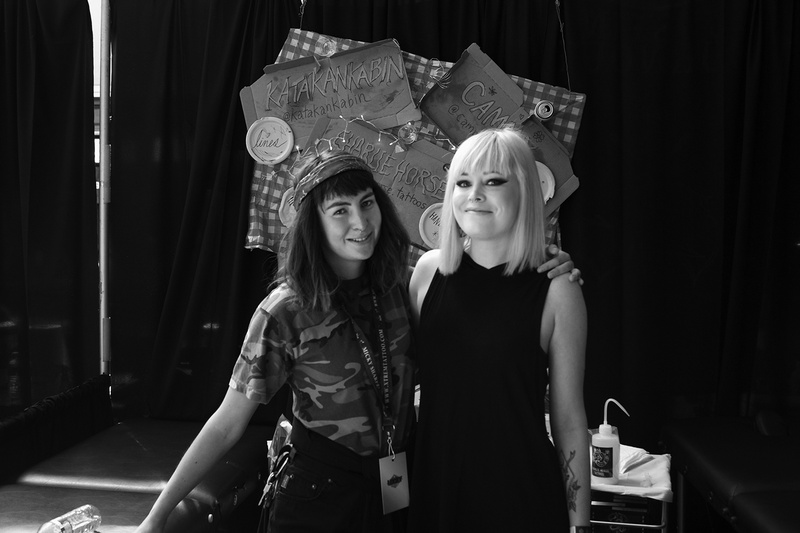 Kat (left) with Hayley Evans of Scene360. Do you have special projects that we can look forward to in the future? Yeah, but it’s still secret [laughs]. I have a really good idea of something I want to organize, because I organized events a lot before tattooing, and I kind of miss it. So we’ll see if I have the energy to do that.